The test teams are always apprehensive about picking up JIRA for Defect Management. The doubt is warranted. It stems from the fact that, though JIRA bug tracking tool is applicable to IT businesses it is a generic ticketing system. Even for IT projects, JIRA’s popularity with the Development teams makes testers and QA teams uncomfortable. 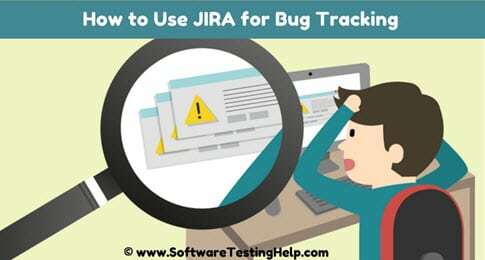 Despite the comfort or discomfort, the test teams have no choice but to use JIRA bug tracking tool in most companies. Why? Simple logic- Companies do not want to invest in multiple tools. It just makes good business sense to maximize your tool utilization and not go crazy with purchasing too many licenses. So, if a Development team is using Atlassian JIRA bug tracking tool to track its requirements, enhancements, tasks or user stories, then the test team, most probably, has to use it for bug tracking. But, relax. JIRA’s Defect Management is just as good as any other tool. In fact, in some situations, it could even be better. This is the tutorial that will demonstrate to you, via screenshots and everything, JIRA’s applicability to bug tracking. So, in JIRA to create a defect would be to create an issue of the type “Bug”. All the options are available to be able to create a defect effectively. These two fields are auto-created by JIRA. All issues will have a unique ID assigned to them by JIRA. Status of all issues is “To-Do” or “New” in JIRA by default on creating a bug. Therefore, all the common facilities for defect reporting are available in JIRA too. In fact, more options such as labels, linking defects, estimating efforts can be used. This will need a little bit of customizing by your JIRA admin, but it is easy to do. For those, do not want to bother with the customization, you can’t go wrong with the default set up as well. Every issue, its updates, people assignment, comments received from the Dev team – everything is tracked in JIRA under the activity log. Link option in the JIRA issue fields lets you link a particular issue to another one. Let’s say if Defect 2 is a duplicate of Defect 1 you can establish that relationship. Similarly, if a defect is blocking a requirement or is related to a requirement – you can make this aspect visible in JIRA. The relationship types are self-explanatory and the usage of simple-common-everyday-language words (such as relates to, caused by, etc.) makes it super easy and intuitive for any JIRA user to use this right. This aids the bulk creation of issues in JIRA at once. Also, if your team is new and you don’t want them creating issues directly into the tool, you can have them report the defects in an excel sheet. Once they are reviewed and confirmed as valid, they can be imported all at once into the tool using this functionality. Whichever way you use it, this is a big plus. This supports better portability of your defect data, especially useful if you want to share your defect data with people who are non-JIRA users. If we have to review JIRA’s analytics in one word, it’s fantastic. Advanced/Power users of JIRA can also create advanced search filters to generate deeper insights. So all in all, bug tracking/defect management in JIRA is very similar if not superior to dedicated bug trackers. Next time you have to work on it, don’t worry. You are in good hands.